What’s Your Next Right Thing? The Next Right Thing landed in my mailbox yesterday. All day I waited patiently so I could start marking up the pages. When the moment finally came for me to open the box, it was almost like my birthday. I hope I don’t sound like I am going overboard, but y’all, this book is that fantastic. I heard back from so many of you who told me what a difference Emily’s online quiz made for you. If you aren’t quite sure if you use your head, heart, or gut to make a decision— hop on over here to find out. If the quiz helped, can you imagine what pages of her wisdom will do? 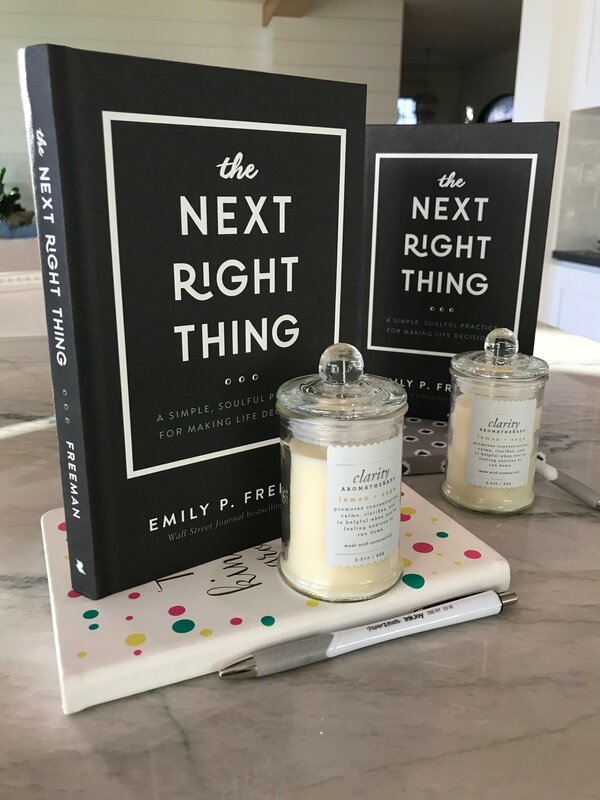 I am so excited about the publication of The Next Right Thing that I bought 2 copies to give away. Much of what Emily shares in her book will make a difference in your life so I wanted to make sure each of you had a chance to win a copy. If you are stuck in fear, doubt, or wading through what feels like too many decisions each day— you need this book. one of my favorite PaperMate Ink Joy pens. Believe me, you will love making notes with this pen in your new journal as you read these life changing words while the scents of lemon and sage fill the air around you. You will think you are in a five star spa for the soul and you never have to leave your house. If you do not already receive the Faith Move Mountains updates in your email inbox: Subscribe to the Faith Moves Mountains blog by clicking the Subscribe button to the right. Not only will you be entered to win one of the packages, you will also receive a free downloadable Prayer Journal based upon the book of James. And Everyone: Please share this post with your friends who may not yet subscribe to Faith Moves Mountains. It is a great way to let them know about Inbox Inspiration. For those who are new to Faith Moves Mountains, we will never share your email with anyone without your permission. So what are you waiting for? Click and Comment. I can’t wait to see who wins! P.S. Sometimes, I think God enjoys it when I stimulate the economy and give things away to brighten someone’s day, so He sprinkles little treasures for me to find. This time, He left 2 Clarity candles. I am not sure if you will gain any clarity when you burn them, but I thought they smelled delightful and it made me smile to be able to include something that I would enjoy using in the giveaway. Sadly, there were only two of the candles at the store so whoever wins will have to report back and let us know if the candles actually bring clarity. P.P.S. A new sweet friend of mine was sharing her memories of shopping with her very devout mother. Her sweet mother would always point out that it was a good idea to buy something if the price ended in a 3- for the Trinity and the Holy Family or a 7— the perfect number or multiples of either number. From dish towels to prom dresses and books to binders, there is always a way to work our faith in Jesus into our conversation. P.P.P.S. If you don’t want to wait until next week to win, please buy this book now and you will get so much more. Emily has extended her free gifts through Friday, April 5. You can go here and find out more about The Next Right Thing and all of the bonuses that are available!